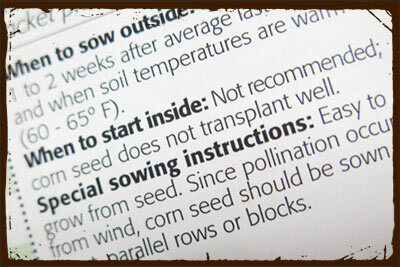 2) Don't Start "x" Vegetable Seeds Indoors: Some vegetable seeds are sown directly into the ground. This is an easy way to start your crops. On the other hand, starting seedlings indoors may be advantageous. But we may fear doing so if our seed packet warns: "When to start indoors: Not recommended." Classic examples of direct sown vegetables are melons, squash, corn, beans, peas, carrots, radishes and beets. Even squash and melons may not be advised for starting indoors. THE CHALLENGE: Certain environmental factors can inhibit the development of direct sown seeds. Cold weather hinders seeds such as corn or beans from germinating. But starting seeds indoors eliminates this issue. Have you found young emerging seedlings that were destroyed by pill bugs or other pests? A larger, established seedling may be unaffected. Sometimes a limited growing season can be a good reason to break the rules on direct sown varieties. To deal with short Summers, starting watermelons indoors might be the best way to ensure that they ripen before the Fall frost. These carrots were started indoors as transplants! THE WORKAROUND: The key to starting problematic seeds indoors lies in optimizing 2 vital factors: 1) Pot Sizes and 2) Time to Transplant. Root vegetables such as carrots and beets will develop a long taproot. Planting the seeds in deep containers allows the roots to develop without interruption. Plants like watermelons and squash work well in wider, deeper pots. There is less root circling and a more natural development of the rooting structure. The other crucial element for success involves knowing when to put those seedlings out into the ground. We might be used to a 6 or 8 week old seedling. This works well for peppers and tomatoes, giving them a great head start. But corn, beans, squash and melons develop very quickly in the summer heat. Try planting them out when they are 2 weeks old. They won't even know that they were started in a pot. And once they're out in the ground, the roots will stretch and develop naturally, without stunting your plant's growth. The bottom line: We don't always have the ideal circumstances for growing our plants. To ensure the best success, we may need to start some things in containers. As long as it works, who cares?